Long time ago i wrote a recipe post http://octobergraves.blogspot.com/2014/05/recipe-1-berry-crumble.html and then i said that i'm gonna be doing posts like that, and that every recipe that will be posted here, will be featured on the other blog as well, but since that other cooking blog didn't work out for various reasons, all of my cooking posts will be shared only here. We are all familiar with smoothies, and i know there's no need for a strict recipe, since you can use any fruit you like, but this one is my current favorite for winter, so i figured i would share as an idea. Chop up the bananas and the kiwis, and squeeze the orange and the tangerine. I add freshly squuezed juice instead of whole pieces of tangerine and orange, because the texture is smoother. Add the cinnamon, and then blend it all up, and you're done. If you're not a cinnamon lover, like myself, don't worry, you can barely taste it, but it's healthy, so you don't lose anything by adding cinnamon. 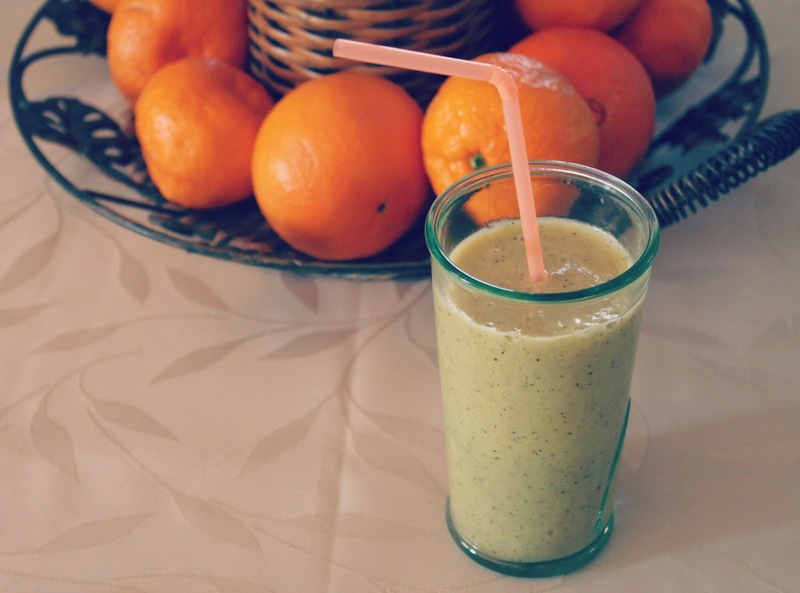 smoothies are pretty good for our body and these smoothies are nutritious and delicious!